"Another jet ski game? How many can there be?" As more and more games are developed and released, the smaller niche markets are beginning to fill up like their more general counterparts. 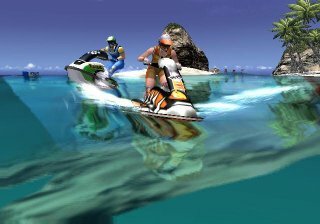 For quite a while, the jet ski game has been a kind of wet-dream for some development teams, out of reach because of the difficulty of getting real time water effects working. However, with the advent of more powerful gaming consoles, more and more companies have decided have a go at developing watercraft games. In this category are a number of niches, and the one in question is jet ski racing. 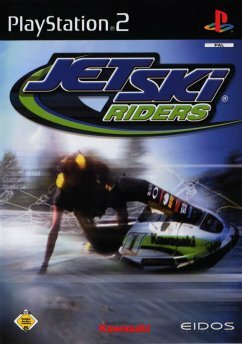 The developers of this Eidos published title, simply named Jet Ski Riders are a mob called Opus. They�ve created a new engine called the �GZWave engine� that is produces some impressive water effects, with a very close fit to the natural swell and movement of shore breakers, and lighting and reflection that can make you nod your head in appreciation. Gameplay comes in the standard forms; Arcade , Championship, Time Trial, Freestyle and head to head two-player action. There�s nothing really out of the ordinary here, or at least insufficient to bring it out in front of the ever-growing pack. 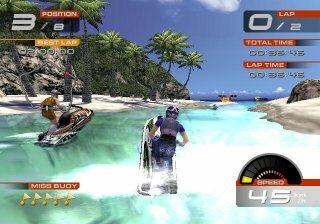 Interestingly, the gameplay of Jet Ski Riders most resembles Wave Race on the GameCube as opposed to Splashdown on the PlayStation2. Splashdown provides a more accessible control to the game, as evidenced by the preference for that title by our younger play-testers. However, don�t write the more difficult to succeed Jet Ski Riders off completely. Some gamers will prefer the more challenging control mechanism, recognising it as being slightly closer to reality. Cornering is probably the most difficult to get right, whereas Splashdown has a more forgiving cornering technique. Rather than the more arcade-y style of presenting you with a host of different craft to ride in all the colours of the rainbow, Jet Ski Riders capitalises on its partnership with Kawasaki to give you a choice of two very realistically modelled Kawasaki Jet Skis. In fact, the two are quite different too. The 750 SXi Pro is a single-person stand up craft that is more manoeuvrable and light on its feet. The Ultra 150 is known throughout the jet ski world as being one of the best 2-person sit down skis available. The stand up machine is more capable of tricks too, so choosing your craft actually becomes quite an intellectual task when considering each course. We mentioned earlier the impressiveness of the graphics and water. However, it must be said that Splashdown�s H2O effects are much more realistic. Opus� creation has more detailed textures on the riders, the jet skis and the surrounding environments, but the water itself isn�t quite there. The ability to customise the wave height really shows off the engine�s prowess, but the water has a shimmery, oily effect rather than the natural clarity of Splashdown. Similarly, the intention was there to get water splashes looking good by using a different technique, but Splashdown�s particle engine works better. There are five or so courses, all beautifully rendered and set in completely different settings. To enhance the beauty and staying power of these courses, there are two different course layouts for each location. Rather than being simple course changes, however, the different layouts come with completely different environmental effects too. So, one course might be in bright daylight, while the alternate track is set at sunset with deep shadows abounding. The New Zealand white water chase is something to behold. Unlike the others, this is a straight from point A to point B race, with no subsequent laps. Rocks and tight corners are prevalent and you�ll be hard pressed to beat this track in your first few attempts. If you�re a diehard jet ski fanatic, you�re going to want this title. Its realism in terms of jet skis, course layouts and handling will surely be attractive to most too, so if you found Splashdown a little too simplistic in its gameplay, or a bit top-heavy with the fantastic stunts, look no further.